← How much is your old clock worth? 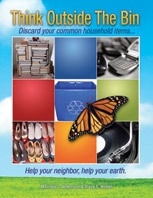 Pizza boxes are hard to recycle, so “Think Outside The Bin” on how you can reuse your used boxes. My local pizza parlor (Cappricio’s in Harrisburg, NC) uses these “GreenBox” pizza boxes, which have recycled content and directions for reuse. You can cut out the perforated edges to make 4 sturdy paper plates and then use the rest for a storage container (great for paper memorabilia, children’s artwork, school work, etc). 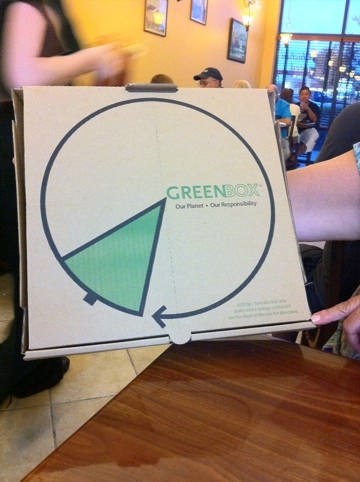 Ask your local pizza company to use this GreenBox and help them to “think outside the bin”! Check out other information on Pizza Box recycling at this previous post. This entry was posted in Pizza boxes and tagged Cappricios, greenbox, postaday2011, recycle pizza box, recycled content, reuse pizza boxes. Bookmark the permalink.